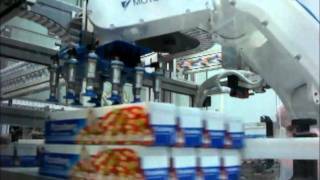 Packaging and food industries have introduced the use of robotic automation since many years. Robotic systems may be installed within all lines in order to pack products in various types of packaging. Be it in carton boxes, special configurations, plastic boxes or film, robots may place products with utmost precision and speed, and significantly reduce production costs, while enhancing quality at the same time. In the particular case of food industry, special robot and software series are available and offer the best solution for said industries. With respect to robotic systems, there are specific series that, apart from ensuring top speeds, may be found in IP 67-enabled versions. IP ratings have been established by IEC (International Electrotechnical Commission) and are known as “Ingress Protection ratings”. An IP 67 rating stands for full protection against dust ingress (designated by the first digit) and protected operation against immersion and water penetration (designated by the second digit). Moreover, robotic systems feature smooth finishing, so there are no areas for bacteria build-up, and integrated through-the-arm cabling for problem-free transfer of signals and air, as well as easy, risk-free cleaning with any type of cleaners. Moreover, a food industry-specific grease is used in their spindle reducers. All software keeps up fully with new technology and offers great solutions to packaging automation. Camera-based analysis of multiple orientation-dependent, sensitive products for approval is a procedure that renders the system smart and extensively flexible at the same time. Also, coordination between robot and products on conveyor belts is extremely useful since the system needs not to stop for pick-up, increasing thus the total line speed. Robotic systems’ main advantage lies in the fact that they may work together with any packaging machinery (carton sealer, film etc) to offer increased operating flexibility to any application. Typically, packaging robots are followed by palletizing robots, however if line speeds are low, packaging robots may also undertake palletizing for additional production cost savings. For all the above reasons, it is easy to understand why all food and pharmaceutical companies apply robots in their production lines.